It’s the 21st century where everyone is so busy keeping busy. We are either super busy with school work and extracurricular activities, trying to balance an exhausting job and a vibrant social life, or just busy taking care of other people (shout out to amazing parents). I believe there is no sin in keeping busy, as long as it is productive and not an addiction. 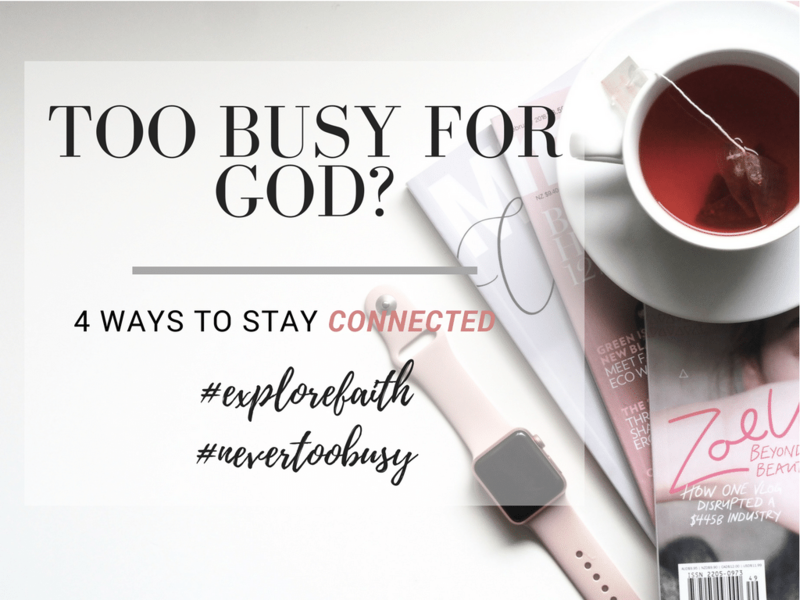 Busyness becomes detrimental when we neglect God intentionally or otherwise. I once experienced this during a season where I was so driven to accomplish goals that my spiritual life suffered as a result. Here, I’m going to talk about a few ways I have learned to transition from a Sunday Christian to a CONSTANT Christian. ACKNOWLEDGE GOD AS THE OMNIPRESENT. We tend to think God is far away or in the heavens somewhere. The bible says otherwise. God is omnipresent, heaven is His throne and the earth, His footstool (Isaiah 66:1-2). In one of my favourite Psalms, David posed a question, “where can I go from your presence?”(Psalm 139:7-10). It paints such a beautiful picture in my mind, the thought that we are never alone, God is always with us, just waiting for us to acknowledge His presence. In the presence of God, there is fullness of joy. When we strive to live constantly in the presence of God, the fruits of the Spirit begin to develop (joy being one of them- Galatians 5:22-23). The fact that God is always present means He is not limited by space or time; we can communicate with Him at any given moment. So while driving, running errands, or working, we can acknowledge Him even just by a simple thought of praise or a quiet song of worship. Prioritizing requires a change of mindset. A lot of our perception has been shaped by society. To grow in our walk with God, we need to let ourselves be transformed by the renewing of our mind (Romans 12:2). We need to go from thinking like the world taught us, to thinking through the lens of the scripture. How does your mind get renewed? I can personally testify that it is by the work of the Spirit and by increasing our knowledge of the Word of God. Committing to studying the word helps to increase our love for God which organically creates a desire to seek the kingdom of God first (Matthew 6:33). A lot of verses in the Bible explains why it is unwise to put all our effort into achieving worldly goals without God (e.g. : Psalm 127:1). Man plans, but God establishes our steps (Proverbs 16:9). Some practical ways I learn to put God first is by praying and thanking God before I get out of bed, committing the day to God while on my way to work and asking God to give me a sensitive and receptive spirit to help me hear Him during the day. When you put God first, life becomes easier. Through the storm, He is Lord, Lord of all. “He is our EVER present help in times of trouble” (Psalm 46:1). When things go wrong, we tend to panic and give way to worry and anxiety. This is a perfect time to run to God instead. God says we should cast our burdens on him because He cares for us. We can receive peace from God when we lay our worries to Him in prayer. God does not promise to always make our problems disappear right away, but He gives us the strength to overcome. Another aspect of leaning on Him comes from Proverbs 3:5, where God says we should not lean on our understanding but rather acknowledge Him in all our ways and He will make our paths straight. We run the risk of allowing pride grow in us when we neglect God in our day to day activities and decision making. By neglecting God, we are only learning to depend more and more on ourselves. It is important to learn to seek God’s perspective on every decision we make, whether major or mundane. “Don’t you know your body is the temple of the Holy Spirit?” (1Corinth 6:19). Sometimes I forget this when I fill it with sweets and skip that workout (lol). God calls us to respect and care for our bodies. This means, eating well or even resting. The Bible shows the importance of resting in several instances. We need to set time aside for ourselves to rest. If God can rest from creating the world, I’m sure you can too. Our time of rest could also be a time of spiritual rejuvenation. Quiet time with God is oh so important. As we schedule rest to benefit our mortal bodies, we also need to schedule a time to rest spiritually in God. This is essential for spiritual growth and maturity.